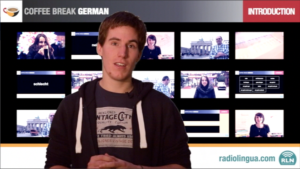 We’re delighted to tell you more about the new course from the Radio Lingua Network. In Coffee Break German, you’ll be learning enough German to get by in a whole range of situations, for example if you’re travelling in a German-speaking country, or indeed if you just want to impress your friends or your relatives who perhaps speak German. In weekly lessons you’ll cover all the language that you need to know, and you’ll join learner Mark, being taught by native speaker Thomas. Thanks Mark, und herzlich Willkommen! My name is Thomas – or in German, mein Name ist Thomas. You see, German is very easy! I come from the south of Germany, from a town in Bavaria called Kempten. As Mark already explained, in Coffee Break German we’re going to cover a range of topics, so, for example, you’ll be learning to order drinks in a café, check into a hotel, ask for directions and talk about yourself so you can make friends with native speakers. The most important thing is – am wichtigsten ist – that you should not think of Coffee Break German as simply a phrase book. Yes, you’ll be learning useful words and phrases, but we will talk about these words and phrases in each lesson and you will develop an understanding of the language and how it works. This way you’ll know what you need to say – and when you need to say it. I’m looking forward to helping you with your German in our weekly lessons together. So, as Thomas explained, it’s not just a case of learning a series of phrases which we can use in particular situations, it’s more about understanding how the language works, so you’ll be learning to manipulate the language – you’ll be learning the patterns of the language – so then you can create your own phrases and cope in many different situations. To help you with this grammatical side of things, with the patterns of the language, each lesson will include a Grammar Guru segment. 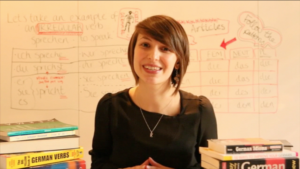 Here’s Kirsten, our Grammar Guru, to tell you a little more about her role in the Coffee Break German experience. Hallo! Ich bin die Kirsten. My name is Kirsten and I’m the Coffee Break German Grammar Guru. I have to say, I’m a total grammar geek and I’m really looking forward to helping you get to grips with your German. Let’s imagine a language is like the human body. Grammar is like the skeleton – it’s what holds everything together, and without it, it would all just fall apart. Some people are a little bit scared of grammar: they think it’s just about learning lots of rules, but I like to think of these rules as patterns, and the more you get to know German, the more you’ll begin to recognise these patterns. You’re not going to have to spend ages going through these complicated grammar books. As Coffee Break German Grammar Guru, it’s my job to simplify everything for you and in each lesson I’ll be helping you get to grips with the particular patterns covered in that lesson. If you tune into my Grammar Guru sections, you’ll start to build up a really solid foundation for your German and all of these patterns will become second nature to you. I’m really looking forward to helping you with your German! Now learning a language isn’t just about the language itself: there’s also the cultural side of things too, and German is the official language of not just Germany, but also Austria and Switzerland, and there are indeed many other parts of the world where German is spoken. To help you get to grips with these cultural aspects we’ve enlisted the services of Julia, our Cultural Correspondent, and we’ll be joined in each lesson by Julia, who will be bringing us some cultural tidbits from around the German-speaking world. Hallo alle zusammen! Ich heisse Julia – my name is Julia, and it’s my job to bring you some cultural insights into the German-speaking parts of the world. In each episode I’ll spend just a couple of minutes explaining an aspect of culture: the traditions we have, the food we eat, some words we use, and some of the strange, little things that make us German speakers so lovable! I’m looking forward to joining you every week and I hope that you enjoy my Cultural Correspondent segments. 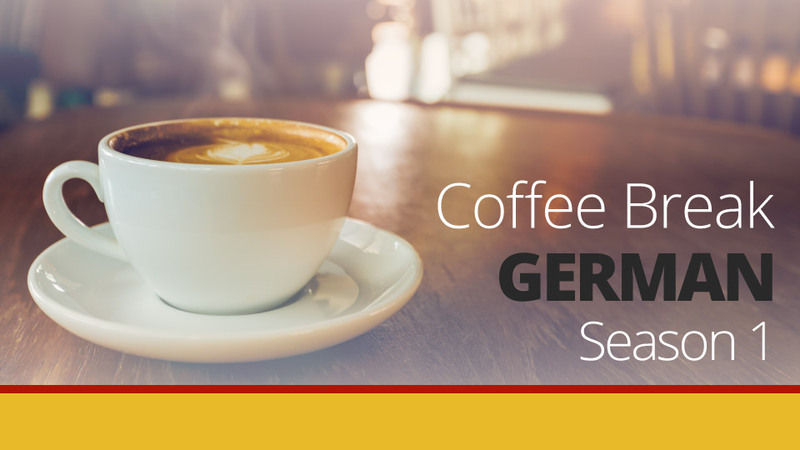 We hope that you really enjoy learning German with Coffee Break German. All the information about the course will be published at coffeebreakgerman.com, and you will be able to download our free audio lessons in iTunes. We also have a premium version of the course which includes lesson notes, transcripts, exercises and additional materials which will help you get to grips with your German more quickly. Full details about the premium course and the iPad version will be provided on launch date. We’re really looking forward to launching Coffee Break German. The course goes live on Wednesday 23rd January 2013. Great Stuff! Well done to all the guys at Coffee Break German! It looks fantastic, just like Coffee Break French and Spanish! You’ve done really great job at other language courses, so I’m really looking forward to learn Germany with you. I would go to Germany for several months this year, and I believe your courses would help a lot. So, thanks and cheers~! Really excited to get started! Ther team looks prepared! Yay! I loved going through Coffee Break Spanish and Coffee Break French, but I didn’t find them until they were done recording. So I was always a little sad that I wasn’t listening to them each week when they were recorded. I am glad this one is just starting and I just need to catch up a little, then I can go along with the podcasts. Good job Mark and thanks. Radio Lingua is awesome. I love learning languages, and I’ll do any Coffee Break Whatever you do. Keep up the good work. Thanks to Kara and Anna too. I’m a huge fan of RLN because of Coffee Break French, who let me learn a language than I’m absolutely in love with, at the same time letting me practice my english, since I’m from Brazil and brazilian portuguese is my main language. Now, you guys announce Coffee Break German, a language that is one of my favorites as well. I could not be more happy with that project, and I’m looking forward to it. listening to this now and i love it! I love this. I listen everyday one episode on my way to work so I don’t feel in wasting my time in the traffic. Great job keep up like this.